TheOatmeal.com’s most popular cat jokes, including “How to Pet a Kitty” and “The Bobcats,” plus 15 new and never-before-seen catthemed comics, are presented in this hilarious collection from New York Times best-selling author Matthew Inman, a.k.a. TheOatmeal.com. Includes pull-out poster! Jesus Rollerblading Christ--another helping of TheOatmeal! Mrow, MOAR kitty comics. 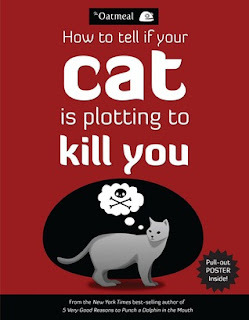 Mr. Oats delivers a sidesplitting serving of cat comics in his new book, How to Tell If Your Cat Is Plotting to Kill You. Yep... I totally bought this book as a Christmas present... Then, well, I read it myself. I couldn't resist! And let me tell you, I laughed! There were a few strips that were just plain odd, but overall this was just fun. When I saw it the first time at the bookstore I had to read through and make the devastating discovery that Casey is totally trying to kill the guy. (haha). 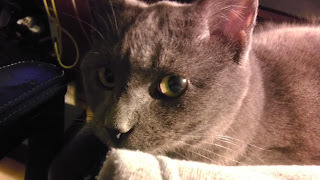 To think that she has such nefarious ideas behind her cute moments. She is sleeping right now, so I can only imagine what she is dreaming about. I had never heard of this comic strip before. I was just drawn to the title because of the whole owning a cat thing. I probably would have been drawn to it even if I didn't have a cat. It just seemed like one of those things I had to check out. And then I decided to buy it for a fellow cat owner, but it didn't actually make it there. Instead I had to check it our for myself. I appreciated the humour and enjoyed laughing about things that Casey does all the time that apparently are the beginning plots to other destructive measures. There is more than that, though. It is basically a comic book about cats. The long-running strip in the collection imagines cats working in the corporate world. That's interesting... And then there are shorter moments that get down and dirty about the cat psyche and what it means for the owners. I love The Oatmeal and this book is one of the best! This looks hilarious. Might need to slip it into The Hubster's Christmas Stocking. He's pretty sure the cats are plotting against him. I also bought this as a Christmas present and read a few pieces from the book as I was wrapping it. It's a great book.